video to get a jumpstart on using the framework to build Single Page Applications (SPAs). 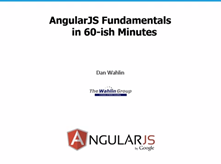 Also check out my AngularJS JumpStart and AngularJS Custom Directives video training courses. MVC framework for data binding (although closely follows the MVVM pattern). MVC framework with support for models, key/value binding, custom events, and more. Provides a real-time environment that runs in the browser an in Node.js. The library supports data binding and templates. Provides support for templates that automatically update as data changes. Data binding framework that provides “interactive data-driven views built on top of JsRender templates”. Lightweight jQuery plugin that supports bi-directional data binding support. MVVM framework with robust support for data binding. For an excellent look at using KnockoutJS check out John Papa’s course on Pluralsight. End to end framework that uses Node.js on the server and provides support for data binding on the client. Now that you’ve seen several client-side data binding libraries, let’s talk through whether or not it’s worth it to move shift an application’s focus from the server to the client and some of the issues that may come up. ASP.NET MVC has data templates, editor extensions, model binders, and other great features that also simplify the process while generating very clean markup on the server. An example of using the EditorFor() method to auto-generate HTML for a Customer type in an ASP.NET MVC view is shown next. If a custom editor template for Customer is defined the template will automatically handle binding properties of the Customer type to different UI controls. How will dynamically generating HTML code in the browser affect search engine optimizations? Have you thought through any security implications of moving a lot of application functionality to the client? Does the application need to run offline? If you answered “no” or were unsure about several of the above questions then it’s time to invest in educating yourself about client-side development practices. As more and more applications move this direction you’ll see more and more customers demanding this type of rich client functionality. I’ll talking about that very subject in upcoming posts. I am using KendoUI from Telerik. It's more than only a MVVM framework, but it has a nice MVVM framework in it. Client side of Server side binding? The answer to this is brain dead simple. IMO, if you only have one client, i.e. HTML, you can take your pick. If you have to support multiple clients, your BEST, and likely only choice is client side, and stick to MVVM!!! We have had great success following MVVM to deliver to multiple clients, i.e. HTML, Silverlight, Windows 8, Android, etc.. Server side UI rendering is simply not a good option. a newbie question: while including such frameworks, say angular.js, i can also include jquery before it, correct? would there be a clash between these frameworks? In data binding, the concept of observables refers to objects and properties that can notify the UI elements when their values have changed. Knockout builds on this concept by requiring objects and properties to be defined with a custom function named observable.